It is believed that Saint Marcellus was born in Arzas of Galicia. A brave pagan, he entered upon the career of arms, hoping to gain a large fortune. He married a young lady named Nona and they were blessed with twelve children. Saint Marcellus was a valorous solider and was promoted to the charge of centurion; he had no thought for any advancement except the sort pertaining to his military life, when he heard the fervent preaching of a holy bishop of the church of Leon. He was converted with his entire family to the Christian religion. All of them except his wife would soon give their blood in honor of their Faith. The birthday of the Emperor Maximian Herculeus was celebrated in the year 298 with extraordinary feasting and solemn rites. Marcellus, as a centurion of the army, a captain in the legion of Trajan then posted in Mauritania or Spain, in order not to defile himself in these impious sacrifices, left his company, throwing down his cincture and his arms and declaring aloud that he was a soldier of Jesus Christ, the eternal King. He was at once committed to prison. 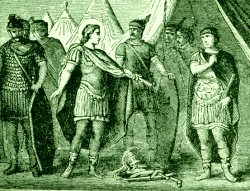 When the festival was over, he was brought before a judge, and having reiterated his faith, was sent under a strong guard to a prefect, Aurelian Agricolaus. This Roman officer passed upon him a sentence of death by the sword. Marcellus was immediately led to execution and beheaded on the 30th of October of the year 298. Cassian, the secretary or notary of the court, refused to record the sentence pronounced against the martyr, because of its injustice. He was immediately hurried to prison, and was beheaded in his turn on the 3rd of December. The children of Saint Marcellus imitated his constancy, and all lost their lives for the defense of the Gospel; three of the boys were hanged and then decapitated at Leon. Their pious mother bought back their bodies for money and buried them secretly; they were later transferred to a church built in their honor in the city of Leon. Reflection: We are ready to die rather than to transgress the laws of God! exclaimed one of the Maccabees. This sentiment must ever be that of a Christian in the throes of temptation. Les Petits Bollandistes: Vies des Saints, by Msgr. Paul Guérin (Bloud et Barral: Paris, 1882), Vol. 13; Little Pictorial Lives of the Saints, a compilation based on Butler's Lives of the Saints and other sources by John Gilmary Shea (Benziger Brothers: New York, 1894). I have suffered the loss of all things, and I count them as dung, that I may gain Christ.